Welcome! 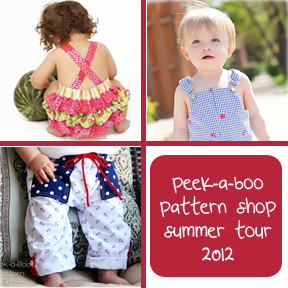 I'm thrilled to be the next stop of the Peek-a-Boo Pattern Shop tour today! Today I've got a cute pattern review, on sale today for $5, plus the opportunity to win 3 patterns of your choice! 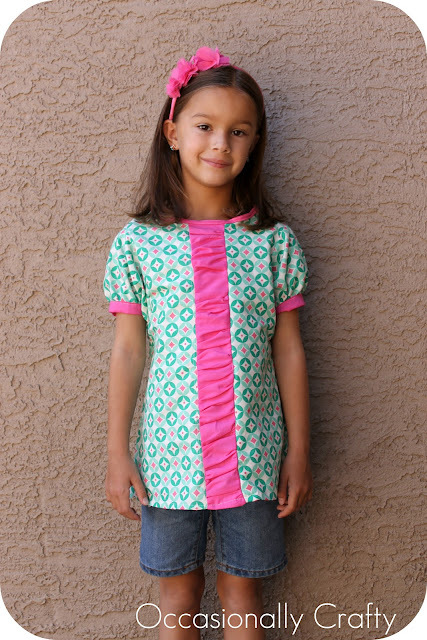 There are so many cute patterns in the shop that I had a hard time choosing one to review. After much hemming and hawing, I finally chose the Evelyn Dress/Swing Top. I just love, love, love the ruffle down the middle! 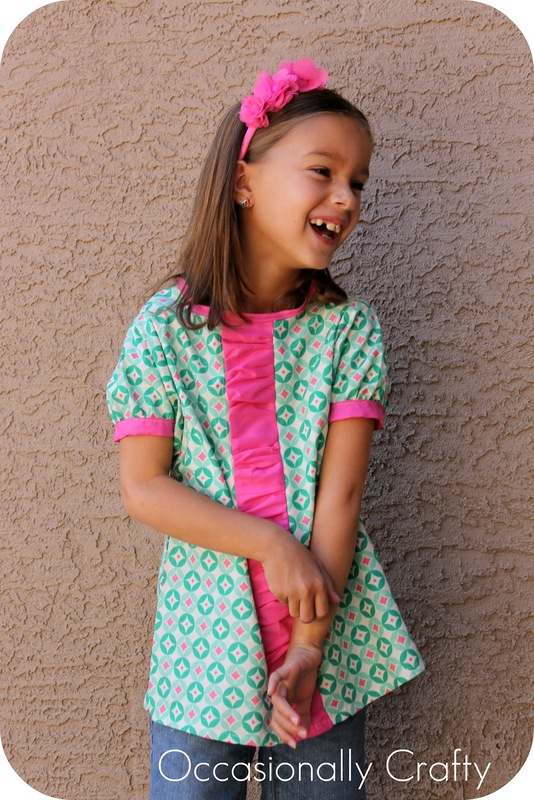 Now, my girl is a little older--7 going on 8, so I was thrilled to find a cute pattern that went up to her size 7! 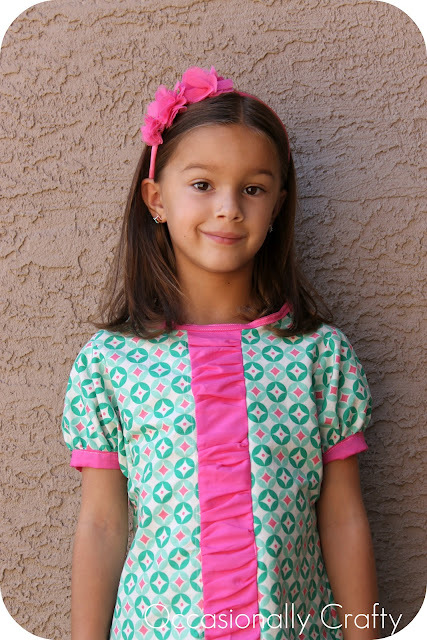 So many cute patterns stop in the toddler years. The pattern is in PDF format, mailed right to you. It was easy to print out and put together, and the directions were very clear and easy to follow, with plenty of photos. There were even tips on making your own bias tape, which I chose to use so to unify my finished product a little more. The only thing I had trouble with was the sleeves. Making the cuff was easy, and inserting the sleeve into the shoulder seam was no problem. But when I sewed the top together, the fit of the sleeve was just not right. I'm not sure what I did wrong, but I just kind of played around with it until it looked decent. It was probably "user error" though, not the pattern. If you'd like to try this pattern out, it's on sale here TODAY ONLY for $5! What a great deal! In addition, Amy, the shop owner, is generously giving away a Pattern 3-pack of your choice! If you'd like to win some cute patterns, use the Rafflecopter entry form below to enter. Good luck, and happy sewing! My favorite pattern is the Ruffle Bum Romper. I think that is just the most adorable little outfit for any baby/toddler. 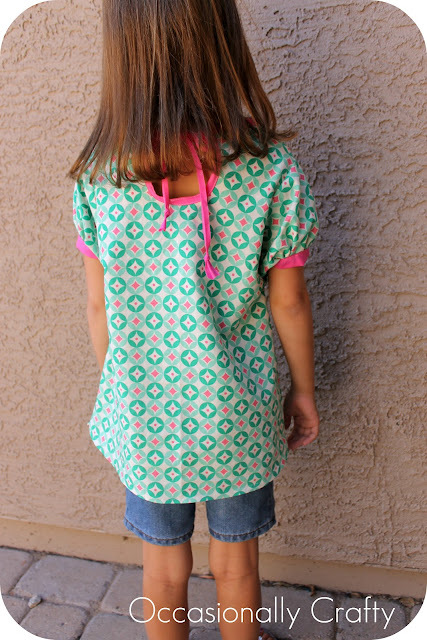 Love the retro romper from Peek-a-Boo patterns! I love love love the Oliver Peacoat! I love the back of this Evelyn dress. I love Peek-A-Boo Patterns! I look forward to having a few minutes to peruse your sight. I am loving the Jackie right now. My favorite is the Viviene party dress! i love the bubble shorts! It's hard to pick a favorite, but I just love the Natalie dress! I've used several of her patterns and loved them, especially the la jolla swimsuit. I love the Gracie Romper! my kids are a little bit too old/big for many of her patterns, but I know my daughter would love the SADIE NIGHTIE: 12 MOS. - 12 YEARS. http://www.peekaboopatternshop.com/product/ruffle-bum-romper-3-mos-24-mos The ruffle bum romper is adorable! I like the Viviene party dress. I love the Ruffle Bum Romper. I like the Annie Petal Dress. I like the Pyper Ruffle Cardi & Hair Bow. The Bubble Shorts - I have to get a head start for our Summer (Australia)!! I like the sweetheart halter and ALL of the precious baby shoes! I love the Clara Tiered Twirled Dress! How adorable!!! I love the CLARA TIERED TWIRL DRESS. Thanks! My favorite pattern is the art smock pattern! Love the Stella Sundress... and many more!